Recently, my husband and I were invited for a night out. I immediately called our babysitter and left a voice mail. She got back to me quickly . . . via text. At first, I wasn't sure how to respond. Should I text her back? Did I really have a choice? After all, in a neighborhood full of kids, getting a good sitter isn't easy! It quickly became clear to me that to be successful, I'd have to get used to communicating in this new medium. As business owners, financial advisors also need to learn how to adapt their communication styles to bridge this generational gap. Using social media in next-gen marketing can be one way to do this; importantly, it may also create a new revenue stream for your business. Not convinced? Let's investigate why social media matters. At Commonwealth, we encourage advisors to define their target market on their websites, crafting messages geared toward that audience. Speaking to your core demographic is a priority, of course. But you might also want to consider the next generation—children of your baby-boomer clients and even their children as well. "Over the next decade, the average investor base profile will change dramatically as the Baby Boomer generation ages, and as Gen X and Gen Y assume more significant roles in the global economy. Known as 'Millennials,' they represent the next big wave of investors for the asset management industry and . . . bring radical shifts in client demographics, behaviors and investment expectations. Understanding and executing the necessary changes in business and client service models to accommodate these shifts will be critical for asset managers as they seek to remain competitive and relevant to this emerging millennial investor base." Social media is a powerful tool to help you "remain competitive and relevant," increasing your chances of managing assets across generations. How Can You Bridge the Generational Gap? 71 percent of online U.S. adults use Facebook. 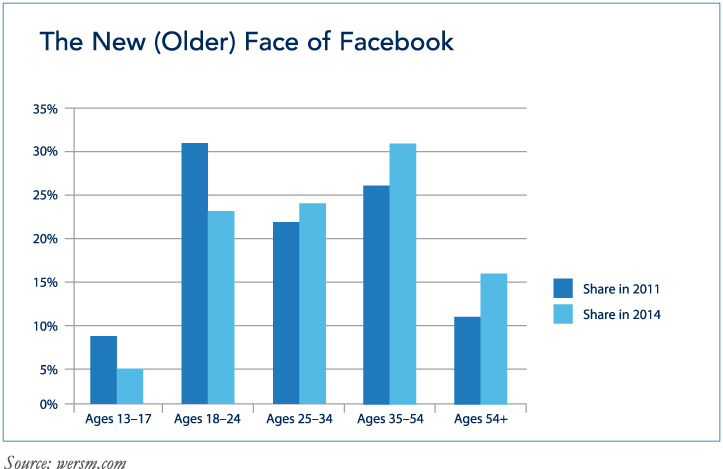 Since 2011, Facebook has seen an 80-percent increase in users older than 54, a 41.4-percent increase in the 35–54 age group, and a 32.6-percent increase in the 25–34 age group (see chart below). 18 percent of online users have a Twitter account. More than half of Twitter users are in the 25–34 age group. Your traditional target market is likely included in the 54+ age group (which is among the fastest growing), although the 25–34 and 35–54 age groups shouldn't be ignored. Your clients' children (and their friends) might be in these groups. This younger generation may view their parents' social media activity—what they're commenting on and who they're engaging with. By establishing a presence on the sites they're using, you can connect with them or have them follow you. Connect with your audience and enhance your brand. You can think of your website as a "hard sell," presenting facts like years of experience, certifications/awards, areas of expertise, and the like. But there's more to you and your firm than a list of services. Your business thrives on relationships, so it's important for people to get to know you on a personal level. Younger generations tend to use the web to gather information. They'll do research before deciding whether to contact you. Make this decision easier for potential clients by enhancing your social media presence. Prospective (and current) clients can get to know another side of you, and you can enhance your brand. Use Facebook to post images and information from your firm through the years (e.g., when you graduated, earned various certifications, started your firm, or moved offices). Include photos and other creative posts to illustrate your history, showing a more personal side while promoting your firm's depth and stability. Stay relevant. In 2004, Commonwealth introduced our website program, EasySite. Back then, many advisors weren't sure why they needed a website but felt like they should have one. Fast-forward to today: social media has, in many ways, become the new website. LinkedIn, Facebook, and Twitter icons are everywhere—in e-mail signatures, on websites, and in ads. A social media presence demonstrates that you're relevant, even forward-thinking, which could make you more attractive to next-gen clients. These sites offer opportunities to align with like-minded individuals and ideal clients. LinkedIn, for example, specializes in professional networking. Consider connecting with younger professionals or centers of influence who have younger clients or work with the next generation (e.g., lawyers). This can expand your network and establish a bridge between you and a younger demographic. In turn, it could lead to connections with similar individuals. Increase online visibility. Besides helping you target next-gen clients, establishing a social media presence can increase your online visibility. Search engines consider social signals, such as likes, comments, and shares. With good content, your posts may move up in search results lists. Younger generations often research online before making many decisions—especially when deciding who should manage their money. Many advisors build their businesses through referrals, so it's vital that those looking for you online can actually find you! Individual LinkedIn profiles, in particular, are a great way to increase the online visibility of your name and your company name. At this point (hopefully), using social media in next-gen marketing sounds like a smart idea. But you might be wondering how to use it. Creating an account isn't enough; it's important to be an active participant. Demonstrate strong customer service. You can engage with visitors to your social media pages by posting regularly and responding to comments. This shows potential and existing clients they can expect strong customer service from your firm. It also shows that you care—and that you're accessible to answer questions and address problems. Establish yourself as a subject matter expert. Social media sites allow you to contribute regular and meaningful insights on current economic situations. By demonstrating industry knowledge and in-depth experience, you'll showcase your skills as a seasoned financial professional. Keep in mind, younger people may expect to see creative or personal information. Adding pet photos, talking about a recent trip, or highlighting a client event can help humanize your business and show that you're approachable. Engage in an ongoing conversation. Radio, newspaper, and television ads are no longer effective in reaching your target audience. Because these mediums are one-sided, it's difficult to engage in an ongoing conversation. On the other hand, social media can provide ongoing dialogue with prospective clients, and future generations will increasingly expect to learn more about you in this way. Asking questions, inviting comments, and being responsive to questions/comments are great ways to encourage engagement. This will foster a sense of trust with those wanting to take the conversation further and speak with you directly. It's an unprecedented time for wealth transfer between generations. To continue to be successful, it's likely that you'll need to make some adjustments in the way you approach prospective clients. R u ready? 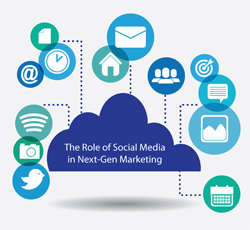 Have you been using social media in next-gen marketing? Which site has been the most effective? Please share your comments below.